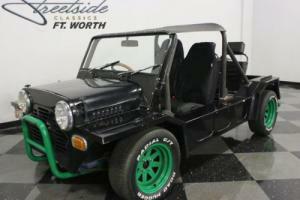 What's a Mini Moke. you ask? 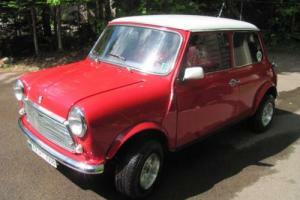 How about a cool utility vehicle based on the ever-popular Austin Mini. Originally proposed as a military vehicle. 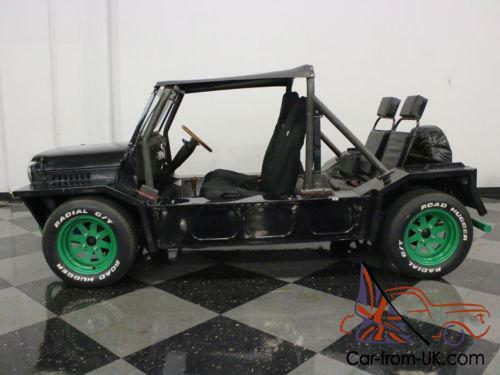 it later found better use as a beach buggy and customizer's favorite. 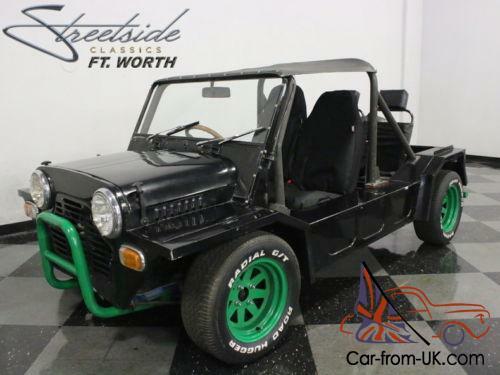 making vehicles like this 1980 Austin Mini Moke perhaps the ultimate expression of form following function. You can certainly see the Jeep-like influences. with separate fenders. flat-sided bodywork. and a simple grille. all of which were designed to make this tough little sportster easy to maintain and repair. And it is indeed all those things. But it's also a great deal of fun. and this one has been tastefully upgraded with a full cage and some oversized rolling stock to make it stand out. The black paint gives it a somewhat industrial look. which we like a lot. and the sheetmetal underneath is about as good as you can expect from a Moke. which is to say. not perfect. On the other hand. a lot of these cars suffered rust issues partially due to the way they were built (box section) and the way they were used (by the ocean). but this one seems to have suffered no such maladies or else was fixed before being bolted back together. 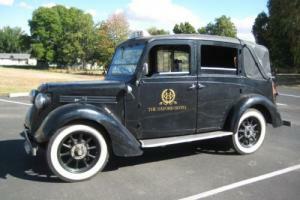 A jaunty tubular bumper up front protects the grille and a simple straight bar does the same out back. There's also a spare tire hanging off the rear end. adding to the Jeep-like go anywhere. do anything look. and we love the engine-forward bulldog stance. It looks like fun just sitting still. It's bare-bone inside. too. 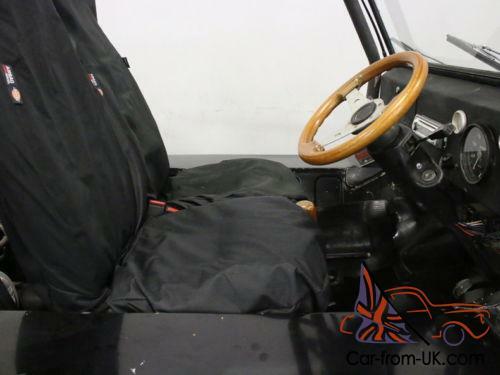 with a pair of bucket seats wearing durable slip covers up front and a pair of even more basic chairs in back. Climb over the sill and settle in and you get a fat wood-rimmed wheel. a fairly comprehensive set of gauges (including a speedometer that reads in KPH). and a 4-speed shifter that you'll have to learn to shift with your left hand (don't worry. the British have been doing it for a century). The floors are bare metal. there are no windows. no A/C. but you do get a decent-sounding AM/FM/CD stereo in the dash that's marine grade so it won't matter if it gets wet. 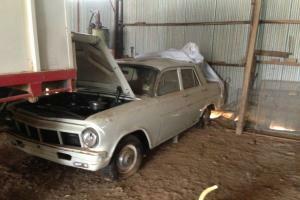 There's age along with normal wear and tear. but this isn't a show piece and if you're buying it because it's pretty. you're doing it wrong. It's basic. yes. but there's a real appeal to something so minimalist. The 1275cc inline-4 isn't a powerhouse but then again. the Moke weighs hardly anything. so performance is lively to say the least. 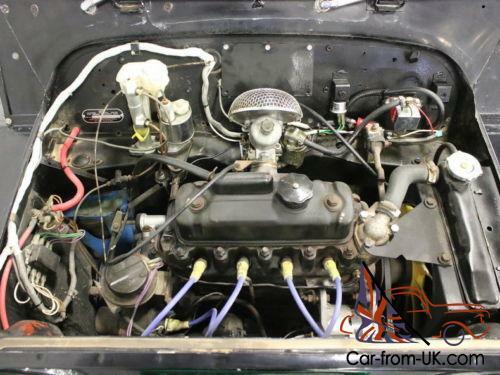 This one is augmented with an upgraded SU carburetor and an exhaust header. so there's a rorty bark from the single tailpipe out back and it pulls well through the gears. The engine bay has awesome service access and yes. that's the radiator over there above the left front tire. so the grille is purely for style. The 4-speed shifts reasonably well once you're used to it and since it uses the same ground-hugging suspension found under the Mini. handling is sharp and surprisingly adept. Bend it into a corner and it just hangs on and you don't even have to lift. The underside is all sheetmetal that's in good shape. along with some simple suspension components that are independent at all four corners. Braking is decent thanks to a low curb weight and the big wheels carry 205/60/13 radials that look gigantic on the little Moke. Not a show piece. but a very unusual and fun piece of hardware for the guy who doesn't want to be another me-too Jeeper. Call today! 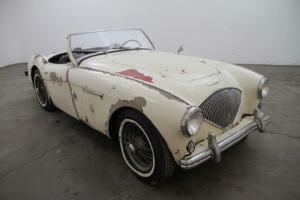 Austin Healey 100/4 BN1 1954, excellent original project! !